As a new department chair, you face many challenges?chief among them that you likely received little or no formal training in academic leadership. You may feel that you face these challenges alone, but in fact a wealth of information and time-tested techniques have been collected over the years from experienced academic administrators. 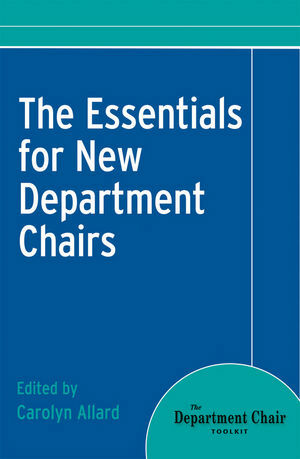 For the first time, this booklet brings together some of the best guidance and strategies that have appeared in The Department Chair, resulting in a collection that is highly relevant to a new chair?s work. The advice contained in these pages can help you build the skills necessary to successfully lead your department. This booklet is full of practical advice that can be put to use immediately, and each article is concisely written so you won?t have to spend valuable time searching for a solution or technique. Whether you?re looking for information on how to work more effectively with your dean, how to better manage your time, how to conduct successful department meetings, or how to best facilitate change, this booklet will help?it covers all these topics and more, from the basics to the specifics. This booklet is structured to provide guidance in four critical areas: chair as leader, getting started, managing conflict, and helping faculty and students thrive. The articles were selected to provide you with timely, comprehensive information. They detail effective practice and represent the best, most innovative thinking on topics and situations you will regularly encounter. This essential resource will become your personal guide as you navigate the responsibilities of your new role as department chair. Carolyn Allard is the editor of The Essentials for New Department Chairs, published by Wiley.